My Carlton is supremely comfortable. I can ride for hours without feeling pinched or sore. My horse must think it's comfortable as well because he allows me to ride for hours. He never complains about being saddled, and has no issues with moving forward with nice free shoulders. I love the feeling of his back rounding and moving, which I can feel very well in my Carlton. I feel very secure and I can also feel everything my horse is doing with his body. I have had a few horses over the past many years and have ridden in a variety of saddles. It wasn't until several years ago that Charlotte Kaspareck introduced me to the Ansur® saddles. In the early summer of 2007, I came across a wonderful young Clydesdale/Thoroughbred cross from Canada. He arrived as very young 3 yr old, but unfortunately for me, he arrived with an extremely sore back from the 14 hours ride to Virginia in a slant trailer. After a thorough veterinary exam and discussion with a highly skilled veterinarian, he suggested that I ride him in an Ansur® saddle after his back healed. 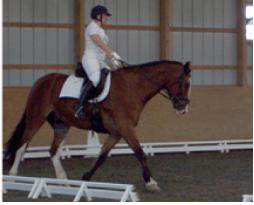 From the first time I placed the Carlton on his back, he was relaxed and supple with much impulsion. My Clyde/TB cross has grown into a compact solid 16.3 hand boy that can be seen flowing across the arena wearing his Carlton.